This is another really simple Mexican chicken casserole, full of that trademark Mexican flavor. 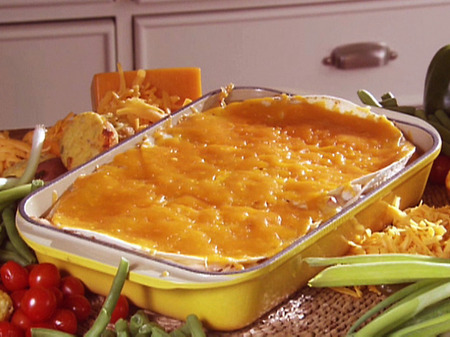 Loads of creamy melted cheese and a creamy flavor, this is classic 'feel good' food and the family will love it. Divide the cheese into two portions and mi half with the chopped spring onions, chicken soup, olives and the sour cream. Mix well. Add the chopped chicken to this mixture. Get your first tortilla and lump tablespoons of this mixture into the middle and roll up firmly. Do this untill all of the mixture has been used up. Put into a suitable casserole dish and arrange so that the tortillas stay closed. The tortillas should form just one layer at the bottom of the casserole dish. Pour the rest of the creamy mixture over the top and then the rest of the cheese. Sprinkle with salt and pepper and leave in the fridge for about half and hour. Remove from the fridge and then put into a preheated oven at 180°C for 40 - 50 minutes. It should come out piping hot and a beautiful golden colour.